I was introduced to Baked Beans recently. It is definitely one of the dishes you need to try. You will enjoy this wonderful dish for it’s rich & satisfying flavor. After having Baked Beans at a restaurant, I decided it was time to give it a try at home. I looked for recipes and many suggested using Canned Beans. However, I had some Dried Red Beans in my pantry which I normally use for making Erissery. I decided to use it for my Baked Beans. I soaked it overnight and made Stove Top Baked Beans for breakfast. Bacon, Ground Beef or Pork is often added to Baked Beans. However, I skipped all meat and kept my baked beans vegetarian. Hubby loved these beans and asked me if I actually made it from scratch. Rinse and drain the soaked beans. Pressure cook the beans in 3-4 cups of water along with bay leaves, garlic and salt to taste. 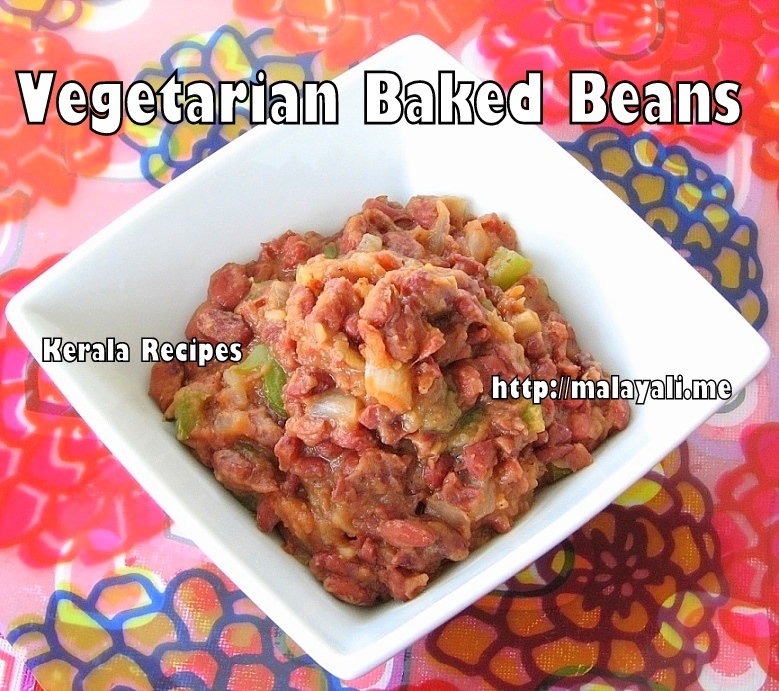 You need to pressure cook the beans for around 20 minutes (5 to 6 whistles) on medium heat so that it becomes tender. Allow the pressure to subside. Open the pan, drain the beans and reserve the liquid. Discard the bay leaves. Meanwhile, heat olive oil in a pan and saute onions until translucent. Add the bell peppers and saute for a few minutes. Reduce heat and add red chilly powder and little salt. Saute for a minute. Add the cooked beans to the pan along with 1/2 cup of reserved liquid. Next add mustard, ketchup, brown sugar, black pepper powder and vinegar. Mix everything together and simmer the beans for 15-20 minutes until thick and mushy. Stir the beans while it gets cooked so that it doesn’t stick to the pan. If the beans appear dry, add more of the reserved liquid and simmer it for a few more minutes.